Approval has been given by Newham's mayor for a £3m structure designed to hide the insalubrious streets of Stratford from the prying eyes of Olympic officials and spectators as they're whisked to the Games. The only problem is, the structure could end up a bigger eyesore than the scene it is meant to disguise. 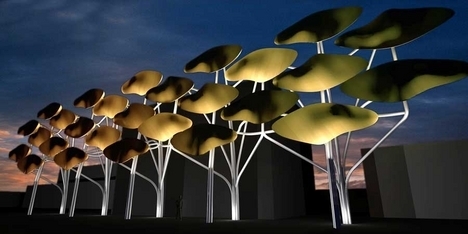 Designed by Studio Egret West, "The Shoal" is a 450-ft long sculpture made from titanium leaves that will sway gently in the breeze and convince those unfamiliar with Stratford's unique charms that the area is one elongated paean to elegance and beauty. It is the centrepiece of a £10 million project that will cleanse the section of the A11 linking Aldgate with the Olympic site. Begone, arcades of fried chicken shops, run-down market stalls and the Anchor Retail Park; say hello instead to manicured hedgerows and streets linked by a "green thread", down which will flow the happy young children of 2012. Quite how "titanium leaves" fit in with this bucolic vision is another matter. While only the most strident supporter of extreme Corbusianism could defend the concrete hell that squats around Stratford, will the Shoal make things any better for residents? Once the motorcade has whisked the IOC and its acolytes away from London and on to Rio de Janeiro, and there's little more than a stiff breeze whipping through east London and trembling those titanium leaves, will there be anything left other than the fading hubris of an ill-thought through plan?